Action Studio is an IDE for writing custom FinalBuilder actions. 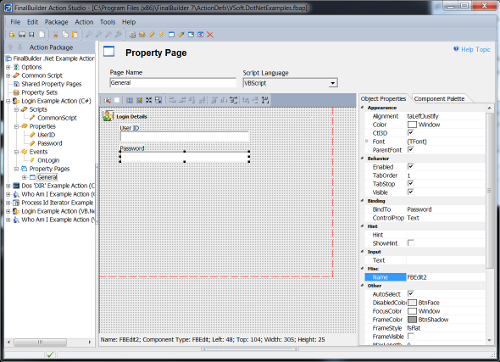 It provides a way to extend the built-in functionality in FinalBuilder. Action Studio is included free and can be accessed under the "Tools" menu. With Action Studio you can create an Action Package containing one or more custom FinalBuilder Actions. The action package defines the action's properties, events, options, and property pages in an XML file format. Actions written in Active Script are completely contained within the action package, whereas COM and .Net based actions refer to external dlls and assemblies for the implementation of the action. FinalBuilder uses a plugin architecture for the implementation of its actions. Actions can be either compiled source code or custom plugins. The compiled plugins, which are shipped with FinalBuilder, can be viewed from the Tools->Package Manager dialog, whereas custom plugins are loaded automatically from a program files subdirectory named ActionDefs. Unlike compiled packages, custom plugins are defined by an XML file. Action Studio can load and save these action package XML files, or you can edit them manually (if you really want to!). These plugin definition files (with file extension .FBAP) are stored in the directory FinalBuilder\ActionDefs. FinalBuilder automatically loads any .FBAP files in the ActionDefs folder when it starts up. Depending on the type of plugin you are creating, you may require extra files alongside the action package file; for example, for a .Net based plugin the assembly must be stored in the Assemblies directory inside the ActionDefs directory so that FinalBuilder can find the referenced assembly. FinalBuilder Professional edition includes a license for Action Studio Professional. Action Studio Professional has the extra capability to import and export protected action packages. A protected action package is encrypted with a password so that others cannot view the action package source. Both FinalBuilder Standard and FinalBuilder Professional automatically load up protected action packages and allow use of the included actions. See also Actions contributed by the FinalBuilder community.